The Vedic liturgy is conserved in the mantra portion of the four Vedas, which are compiled in Sanskrit. The religious practices centered on a clergy administering rites. This mode of worship is, largely unchanged, being practiced by a small fraction of conservative Śrautins who continue the tradition of oral recitation of hymns learned solely through the oral tradition. 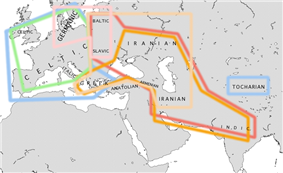 Historical spread of the chariot. Dates given in image are approximate BC years. Indo-European isoglosses, including the centum and satem languages (blue and red, respectively), augment, PIE *-tt- > -ss-, *-tt- > -st-, and m-endings. Frequency distribution of R1a1a, also known as R-M17 and R-M198, adapted from Underhill et al. (2009). 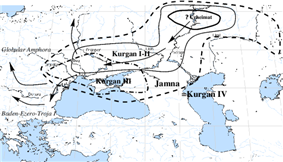 The development of the Kurgan culture according to Marija Gimbutas' Kurgan hypothesis. 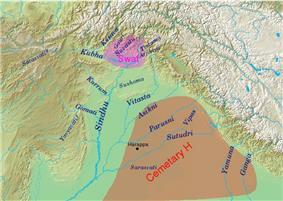 The Vedic religion was the religion of the Indo-Aryans,[note 3] and existed in northern India from c. 1750 to 500 BCE. 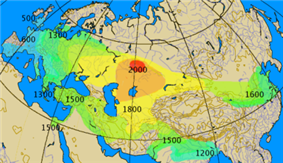 [note 4] The Indo-Aryans were a branch of the Indo-European language family, which originated in the Kurgan culture of the Central Asian steppes. The Indo-Aryans were pastoralists who migrated into north-western India after the collapse of the Indus Valley Civilization,[note 5] bringing with them their language and religion. 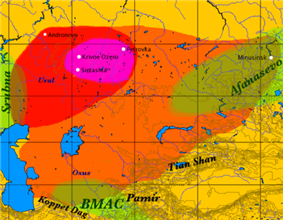 They were closely related to the Indo-Aryans who founded Mitanni kingdom in northern Syria (ca.1500-1300 BCE). 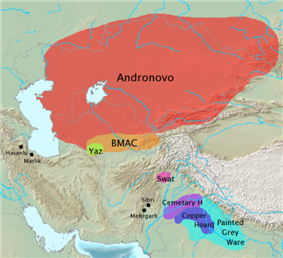 Both groups were rooted in the Andronovo-culture in the Bactria-Margiana era, in present northern Afghanistan, and related to the Indo-Iranians, from which they split-off around 1800-1600 BCE. Their roots go back further to the Sintashta culture, with funeral sacrifices which show close parallels to the sacrificial funeral rites of the Rig Veda. 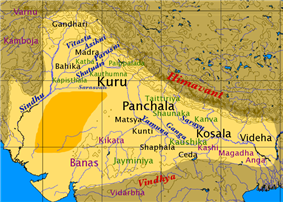 The Vedic religion of the later Vedic period co-existed with local religions, such as the Yaksha cults,[web 1] and was itself the product of "a composite of the indo-Aryan and Harappan cultures and civilizations". David Gordon White cites three other mainstream scholars who "have emphatically demonstrated" that Vedic religion is partially derived from the Indus Valley Civilizations. The religion of the Indo-Aryans was further developed when they migrated into the Ganges Plain after c. 1100 BCE and became settled farmers, further syncretising with the native cultures of northern India. Texts dating to the Vedic period, composed in Vedic Sanskrit, are mainly the four Vedic Samhitas, but the Brahmanas, Aranyakas and some of the older Upanishads (Bṛhadāraṇyaka, Chāndogya, Jaiminiya Upanishad Brahmana) are also placed in this period. The Vedas record the liturgy connected with the rituals and sacrifices performed by the 16 or 17 Śrauta priests and the purohitas. According to traditional views, the hymns of the Rigveda and other Vedic hymns were divinely revealed to the rishis, who were considered to be seers or "hearers" (Śruti means "what is heard") of the Veda, rather than "authors". In addition the Vedas are said to be "apaurashaya", a Sanskrit word meaning "uncreated by man" and which further reveals their eternal non-changing status. 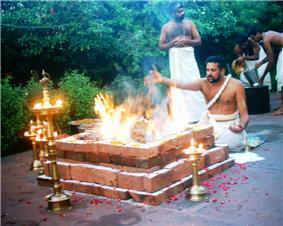 A Śrauta yajna being performed in South India. The mode of worship was worship of the elements like fire and rivers, worship of heroic gods like Indra, chanting of hymns and performance of sacrifices. The priests performed the solemn rituals for the noblemen (Kshatriyas) and wealthy commoners Vaishyas. People prayed for abundance of children, rain, cattle (wealth), long life and an afterlife in the heavenly world of the ancestors. This mode of worship has been preserved even today in Hinduism, which involves recitations from the Vedas by a purohita (priest), for prosperity, wealth and general well-being. However, the primacy of Vedic deities has been seconded to the deities of Puranic literature. The Agnicayana, the sophisticated ritual of piling the fire altar. Though a large number of devatas are named in the Rig Veda, only 33 devas are counted, eleven each of earth, space and heaven. The Vedic pantheon knows two classes, Devas and Asuras. The Devas (Mitra, Varuna, Aryaman, Bhaga, Amsa, etc.) are deities of cosmic and social order, from the universe and kingdoms down to the individual. The Rigveda is a collection of hymns to various deities, most notably heroic Indra, Agni the sacrificial fire and messenger of the gods, and Soma, the deified sacred drink of the Indo-Iranians. Also prominent is Varuna (often paired with Mitra) and the group of "All-gods", the Vishvadevas. Vedic philosophy primarily begins with the later part of the Rigveda, which was compiled before 1100 BCE. Most of the philosophy of the Rigveda is contained in the sections Purusha sukta and Nasadiya sukta. The term is inherited from the Proto-Indo-Iranian religion, the religion of the Indo-Iranian peoples prior to the earliest Vedic (Indo-Aryan) and Zoroastrian (Iranian) scriptures. Asha (aša) is the Avestan language term (corresponding to Vedic language ṛta) for a concept of cardinal importance to Zoroastrian theology and doctrine. Conformity with Ṛta would enable progress whereas its violation would lead to punishment. The term Dharma was already used in Brahmanical thought, where it was conceived as an aspect of Rta. The concept of Yajna or sacrifice is also enunciated in the Purusha sukta where reaching the Absolute itself is considered a transcendent sacrifice when viewed from the point of view of the individual. ...this was a time when traditional religious practices and beliefs were reassessed. The brahmins and the rituals they performed no longer enjoyed the same prestige they had in the Vedic pariod". Indian philosophers came to regard the human as an immortal soul encased in a perishable body and bound by action, or karma, to a cycle of endless existences. The Vedic religion gradually metamorphosed into the various schools of Hinduism, which further evolved into Puranic Hinduism. However aspects of the historical Vedic religion survived in corners of the Indian subcontinent, such as Kerala where the Nambudiri Brahmins continue the ancient Śrauta rituals, which are considered extinct in all other parts. A formal distinction was maintained between Srauta rites (rites using the Vedic hymns), which were necessarily performed by priests, and Griha ("domestic") rites, performed by the Aryan householder himself; but both the latter and the former were subject to priestly influence. Some domestic rites became almost indistinguishable from the priestly Srauta sacrifices; and, even where older ceremonies were retained, they were usually interwoven with elements of the priestly ritual. Vedic religion was followed by Upanishads which gradually evolved into Vedanta, which is regarded by some as the primary institution of Hinduism. Vedanta considers itself "the purpose or goal [end] of the Vedas." The philosophy of Vedanta (lit. “The end of the Vedas"), transformed the Vedic worldview to monistic one. This led to the development of tantric metaphysics and gave rise to new forms of yoga, such as jnana yoga and bhakti yoga. There are some conservative schools which continue portions of the historical Vedic religion largely unchanged. (see Śrauta, Nambudiri). The Vedic gods declined but did not disappear, and local cults were assimilated into the Vedic-brahmanic pantheon, which changed into the Hindu pantheon. Deities arose that were not mentioned or barely mentioned in the Veda, especially Shiva and Vishnu, and gave rise to Shaivism and Vaishnavism. Mimamsa philosophers argue that there was no need to postulate a maker for the world, just as there was no need for an author to compose the Vedas or a god to validate the rituals. Mimamsa argues that the gods named in the Vedas have no existence apart from the mantras that speak their names. To that regard, the power of the mantras is what is seen as the power of gods. The non-Vedic Sramana traditions existed alongside Brahmanism. [note 8][note 9][note 10] These were not direct outgrowths of Vedism, but movements with mutual influences with Brahmanical traditions, reflecting "the cosmology and anthropology of a much older, pre-Aryan upper class of northeastern India". Jainism and Buddhism evolved out of the Shramana tradition. There are Jaina references to 22 pre-historic Tirthankaras. In this view, Jainism peaked at the time of Mahavira (traditionally put in the 6th Century BCE). Buddhism, traditionally put from c. 500 BC, declined in India over the 5th to 12th centuries in favor of Puranic Hinduism and Islam. ^ The term ancient Hinduism is also applied, but not appropriate. In the 19th century the term "Hinduism" was restricted to "living Hinduism", with its emphasis on Bhakti. Under the influence of the Neo-Hinduistic reform movements, which emphasised the Vedic heritage, and the growing awareness of the continuity of certain elements, the term "ancient Hinduism" has been applied by some to the Vedic period. Nevertheless, the period between 800 BCE and 200 BCE sees fundamental changes, which result in "Hinduism". Other incorrect terms are Brahmanism and Vedic Brahmanism. The Encyclopædia Britannica of 2005 uses all of "Vedism", "Vedic Brahmanism" and "Brahmanism", but reserves "Vedism" for the earliest stage, predating the Brahmana period, and defines "Brahmanism" as "religion of ancient India that evolved out of Vedism. It takes its name both from the predominant position of its priestly class, the Brahmans, and from the increasing speculation about, and importance given to, Brahman, the supreme power." ^ Stephanie W. Jamison and Michael Witzel, Vedic Hinduism, 1992, "... to call this period Vedic Hinduism is a contradiction in terms since Vedic religion is very different from what we generally call Hindu religion – at least as much as Old Hebrew religion is from medieval and modern Christian religion. However, Vedic religion is treatable as a predecessor of Hinduism." 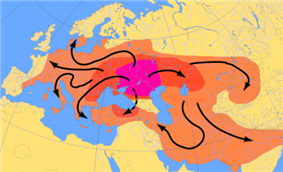 ^ The Aryan migration theory has been challenged by some researchers, due to a lack of archaeological evidence and signs of cultural continuity, hypothesizing instead a slow process of acculturation or transformation. 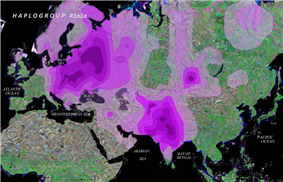 Nevertheless, linguistic and archaeological data clearly show a cultural change after 1750 BCE, with the linguistic and religious data clearly showing links with Indo-European languages and religion. According to Singh, "The dominant view is that the Indo-Aryams came to the subcontinent as immigrants." ^ According to Michaels, the period between 200 BCE and 1100 CE is the time of "classical Hinduism", since there is "a turning point between the Vedic religion and Hindu religions". ^ Although the concept of reincarnation originated during the time of the Shramanic reforms and the composition of the Upanishads, according to rishis believed in reincarnation and karma. ^ >Y. Masih (2000) In : A Comparative Study of Religions, Motilal Banarsidass Publ : Delhi, ISBN 81-208-0815-0 Page 18. "There is no evidence to show that Jainism and Buddhism ever subscribed to vedic sacrifices, vedic deities or caste. They are parallel or native religions of India and have contributed to much to the growth of even classical Hinduism of the present times." ^ a b Stietencron 2005, p. 231. ^ a b Smart 2003. ^ a b c d Muesse 2003. ^ "The Four Vedas". About dot Com. Retrieved 7 November 2012. ^ a b Singh 2008, p. 186. ^ B. S. Ahloowalia (2009). Invasion of the Genes Genetic Heritage of India. Strategic Book Publishing. ^ Roger D. Woodard (18 August 2006). Indo-European Sacred Space: Vedic and Roman Cult. University of Illinois Press. pp. 242–. ^ White, David Gordon (2003). Kiss of the Yogini. Chicago: University of Chicago Press. p. 28. ^ Ralph Thomas Hotchkin Griffith, The Texts of the White Yajurveda. Translated with a Popular Commentary (1899), 1987 reprint: Munshiram Manoharlal, New Delhi, ISBN 81-215-0047-8. ^ Dudi, Amar Singh. Ancient India History. Neha Publishers and Distributors (10 January 2012). Ch. 9. Vedic Religion, Rituals. ISBN 978-93-80318-16-5. ^ Sabir, N. Heaven Hell OR??. Publisher: Xlibris (7 October 2010). P. 155. ISBN 1453550119. ^ Krishnananda. Swami. A Short History of Religious and Philosophic Thought in India, Divine Life Society. p. 18-19. ^ Muesse 2011, p. 115. ^ "Patanjali’s Yoga Darsana – The Hatha Yoga Tradition," InfoRefuge. ^ Kelkar, Siddharth. UNESCO’s leg-up for city Veda research. Express India. Retrieved 16 June 2012. ^ Michaels 2004, p. 39. ^ Jain, Arun. 2008. Faith & philosophy of Jainism. p. 210. ^ Helmuth von Glasenapp,Shridhar B. Shrotri. 1999. Jainism: an Indian religion of salvation. P.24. "Thus not only nothing, from the philosophical and the historical point of view, comes in the way of the supposition that Jainism was established by Parsva around 800 BCE, but it is rather confirmed in everything that we know of the spiritual life of that period."